That all my effort was in vain. And seldom do I dare complain. My lowest while still staying sane. To hold to life long as I could. That all this effort did no good. With my own fate I must contend. As all beset by struggle should. Well, I’m kicking off this year’s Blindspot series a bit late, but what’s a few days’ difference? I was nonetheless eager to see how my Blindspot picks this year would measure up to last year’s, especially since my #1 last year (Shuffle) was the first one I saw. I had high hopes for All Is Lost as well, due to its simple survival narrative that I knew would have echoes of Cast Away. Yet, while those echoes are present and the film overall is well executed, I was rather disappointed in the end product. 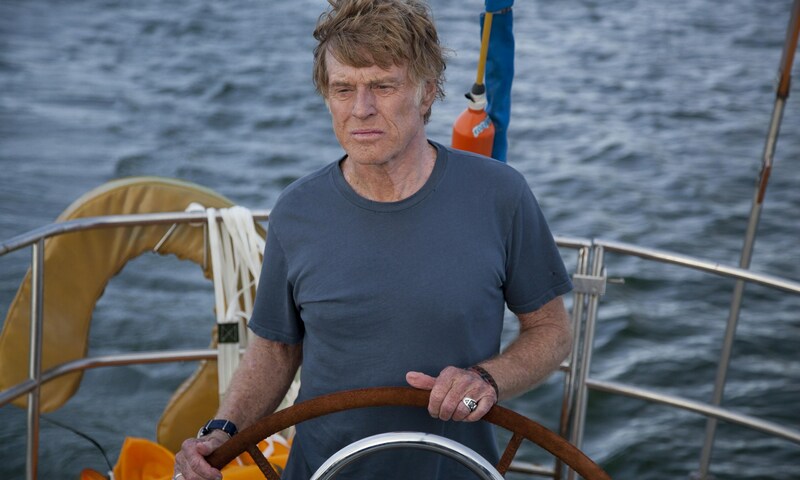 All Is Lost is notable for being essentially a one-man show, in which Robert Redford is the sole actor on screen in a straightforward survival tale of man vs. nature. Credited as “Our Man,” Redford barely speaks throughout (though there were a few more words than I was expecting), instead reacting to the various maritime dangers that plague him as a lone sailor, from destructive debris to vicious storms. It’s a credit to Redford’s acting ability that he can hold a movie completely on his own while in his seventies, and his nameless protagonist remains admirably calm through much of his travail, finding clever survival solutions others might not think of while also doing an inexplicable action now and then (like going up on deck in a storm for reasons I didn’t quite grasp). As an acting showcase for Redford and a no-frills survival story, All is Lost delivers reasonably well, with an understated Golden Globe-winning score and convincing effects and aquatic photography to create the man’s seafaring isolation. But somehow I expected more. My VC pointed out right away that we’re given no details about Our Man, no background or reason to care about him other than that he’s in the plight he is. Again, it’s easy to point to other isolation movies for comparison: In Cast Away or Life of Pi (both favorites of mine), we get to know the main characters before they’re thrown to the elements, strengthening our sympathy because we see what they’ve lost and what brought them to their predicament. Even with an oddly vague opening voiceover, we know literally nothing about “Our Man” except his immediate circumstances; that was likely the successful intent, but it doesn’t keep me as invested as those other films. Plus, there’s the simple fact that the film was rather boring. I probably shouldn’t have tried to watch it after a long day at work, but I stuck with it still. My Redford-loving VC, on the other hand, gave up after a half hour, despite the fact she once thought she’d be happy watching Robert Redford read the phone book. (I guess that would have more dialogue, though.) I’m sure the lack of dialogue is more realistic, but there’s a reason Tom Hanks had a volleyball to talk to in Cast Away. Wilson allowed for greater character engagement, just as Richard Parker the tiger did in Life of Pi, which also benefited from a consistent voiceover narration. They gave us a glimpse into the mindset of the human character, while Our Man’s actions don’t really reveal anything about him, even though his story is propelled by action and reaction alone. Redford evokes his growing desperation and despair, but those emotions only go so far. Without fully engaging with the character, we’re simply watching what any competent person would do in this situation, and that detachment was a bit of a letdown. I can’t impugn Redford’s acting ability or the production values since All Is Lost does what it means to do expertly. It just wasn’t as involving as other survival stories. And it’s not solely because of the sparse dialogue either, nor the lack of character development alone. The Red Turtle held my attention with literally no dialogue at all, while Dunkirk was absolutely thrilling with hardly any character backgrounds. I guess it’s the combination of its monotonous pace and surface-only protagonist that made it feel wanting compared with more engaging films of its genre. While my VC might disagree, it’s by no means a bad film, just one I can’t see myself spending time on again.